Russian anarchist, born of an aristocratic family at Torjok, in the government of Tver, in 1814. As an officer of the Imperial Guard, he saw service in Poland, but resigned his commission from a disgust of despotism aroused by witnessing the repressive methods employed against the Poles. He proceeded to Germany, studied Hegel, and soon got into touch with the leaders of the young German movement in Berlin. From there he went to Paris, where he met Proudhon and George Sand, and also made the acquaintance of the chief Polish exiles. From Paris he journeyed to Switzerland, where he resided for some time, taking an active share in all socialist movements. While in Switzerland he was ordered by the Russian government to return to Russia, and on his refusal his property was confiscated. In 1848, on his return to Paris, he published a violent tirade against Russia, which caused his expulsion from France. The revolutionary movement of 1848 gave him the opportunity of entering upon a violent campaign of democratic agitation, and for his participation in the Dresden insurrection of 1849 he was arrested and condemned to death. The death sentence, however, was commuted to imprisonment for life, and he was eventually handed over to the Russian authorities, by whom he was imprisoned and finally sent to eastern Siberia in 1855. He received permission to remove to the Amur region, where he succeeded in escaping, making his way through Japan and the United States to England in 1861. He spent the rest of his life in exile in western Europe, principally in Switzerland. In 1869 he founded the Social Democratic Alliance, which, however, dissolved in the same year, and joined the International. In 1870 he attempted a rising at Lyons on the principles afterwards exemplified by the Paris Commune. At the Hague congress of the International in 1872 he was outvoted and expelled by the Marx party. He retired to Lugano in 1873 and died at Bern on the 13th of June 1876. 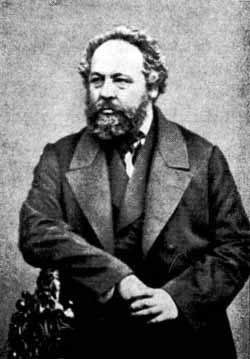 Nothing can be clearer or more frank and comprehensive in its destructiveness than the revolutionary anarchism of Bakunin. He rejects all the ideal systems in every name and shape, from the idea of God downwards; and every form of external authority, whether emanating from the will of a sovereign or from universal suffrage. "The liberty of man", he says in his Dieu et l'État (published posthumously in 1882) "consists solely in this, that he obeys the laws of nature, because he has himself recognized them as such, and not because they have been imposed upon him externally by any foreign will whatsoever, human or divine, collective or individual." In this way will the whole problem of freedom be solved, that natural laws be ascertained by scientific discovery, and the knowledge of them be universally diffused among the masses. Natural laws being thus recognized by every man for himself, he cannot but obey them, for they are the laws also of his own nature; and the need for political organization, administration and legislation will at once disappear. Nor will he admit of any privileged position or class, for "it is the peculiarity of privilege and of every privileged position to kill the intellect and heart of man. The privileged man, whether he be privileged politically or economically, is a man depraved in intellect and heart." "In a word, we object to all legislation, all authority, and all influence, privileged, patented, official and legal, even when it has proceeded from universal suffrage, convinced that it must always turn to the profit of a dominating and exploiting minority, against the interests of the immense majority enslaved." Bakunin's methods of realizing his revolutionary program are not less frank and destructive than his principles. The revolutionary, as he would recommend him to be, is a consecrated man, who will allow no private interests or feelings, and no scruples of religion, patriotism or morality, to turn him aside from his mission, the aim of which is by all available means to overturn the existing society.